Addis Fine Art is very pleased to announce its first participation in the New York edition of 1-54 Contemporary African Art Fair taking place between the 3 - 5 May, at Industria, West Village, NYC. The gallery is excited to present for the very first time in North America, new works by emerging Israeli-Ethiopian artist, Nirit Takele, who has recently had two sell-out solo shows "Three views", Hezi cohen Gallery, Tel Aviv and "Flying with Angels", Addis Fine Art Project Space, London. Nirit Takele, born in Ethiopia in 1985, immigrated to Israel in 1991. She is a bold colorist, building up faceted figurative bodies through the application of near abstract flat forms. With a sharp understanding of the power adjacent colors impart upon one another, her figures pop from the canvas, with vivid dimensionality. She states, "My interest in painting stems from building the figures in color and creating tension between the figurative to the abstract forms." 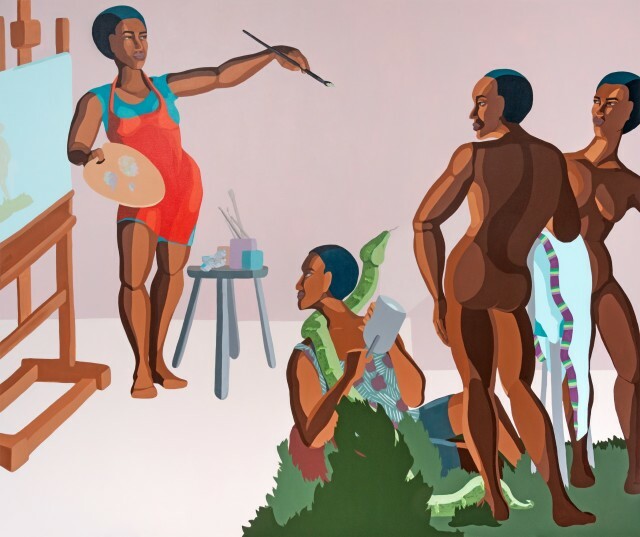 Although she grew up with very few memories of her childhood in Ethiopia, she explores her cultural heritage in her works, illustrating the everyday life of the Israeli Ethiopian community and finding inspiration in old Ethiopian sagas and folk tales remembered from her youth, stating "being part of a minority population gives me inspiration in painting." Nirit's works are included in prestigious public and private collections including the Israel Museum, the START Collection, and Shenkar College Collection. She is the 2017 winner of the Sotheby's 'Under the Hammer' prize and her work has been shown in numerous exhibitions including a group exhibitions at the Haifa Museum 2017 and The Negev Museum of Art 2016. Nirit presently works from her studio in Tel Aviv. She has been painting from a very young age practicing her skills by studying the works of artists like Peter Paul Rubens, Diego Rivera and David Hockney. In 2015, she graduated with honours from Shenkar College, receiving The Talia Sidi Prize.